Driving down the California coast is not only easy on the eyes, but it shows off the diverse landscapes the Golden State is made up of. From the farmland in the middle of the state to the small seaside towns that hug the coast, there’s no better way to explore California than to drive along the state’s most famed road. The most important rule is: start your trip as early as humanly possible. You do not want to be driving along Highway 1 at night for numerous reasons. This road can be driven in one day, but it’s ideal to break it up into 3-5 days to properly stop at the towns along the way. So grab your favorite snacks and road trip playlist, and map out your route with these Pacific Coast Highway stops. Stop and stretch your legs besides the scenic ocean views at Mavericks Beach (of Mavericks surf competition fame), though you will probably not see the monster waves which make rare appearances. For breakfast, Granola’s Coffee House is a solid choice for hearty and healthy breakfast choices from egg sandwiches to freshly-made smoothies, as well as coffee that will serve as the perfect fuel for the long road ahead. This college town is perfect for fueling up on coffee alongside all the local UCSC students and surfers. Stop at The Buttery for delicious pastries or Cafe Brasil for acai bowls that never disappoint. A great place to stretch your legs is the Santa Cruz Beach Boardwalk and the adjacent beach, which is a lot calmer than the boardwalk and a great break from the sensory overload. Breathe in that salty ocean air along Cannery Row, the city’s main drag that used to be filled with sardine canneries back in the day. If time permits, take a detour on the 17-Mile Drive, where the often fog-shrouded coastal scenery always makes it worth it. Keep an eye out for The Ghost Tree, a gnarled, white cypress tree that looks like it came right from a Brother’s Grimm fairytale. Monterey’s swanky neighbor is known for its rich artistic community, where writers and artists live and work (director/actor Clint Eastwood was the mayor of Carmel at one time). Dogs are revered in this town, and there are plenty of places to cater to any pups in tow, including Diggidy Dog, for dog treats and toys. For humans, the Carmel Coffee & Cocoa Bar in downtown is worth stopping by for hot chocolate and hearty sandwiches. This stretch of Highway 1 may be one of the most scenic routes, but make sure to take your motion sickness meds if you are prone to carsickness (those windy roads are no joke). Along Highway 1 is the Bixby Creek Bridge that is as stunning in real life as it is in photographs. For excellent comfort food and equally good views, Nepenthe is a good place to stop nearby. This walkable college town is ideal to walk around for an hour or so, with a beautiful downtown area that has a creek running right through the middle of it. Check out the nearby Mission San Luis Obispo de Tolosa, one of the historic California missions. There are a number of delicious meal options in town including gyros at Petra or tri-tip sandwiches at Old San Luis BBQ Company. This town was formed by a group of Danish settlers who were tired of Midwest winters and were looking for sunnier prospects out west, hence the name Solvang (sunny field). Stroll down Alisal Road to admire the Danish architecture and make sure to pick up aebelskivers (Danish pancakes puffs) at Solvang Restaurant’s to-go window. Stop at Copenhagen Sausage Garden to counteract all that sugar with a cold beer and savory sausages. This beach city is a must-stop along Highway 1, if only to swoon over the Monterey-style adobe on State Street and dream about living in one of the Mediterranean-style homes near the ocean. There are plenty of good dining options, but Mexican should be high on your list at a place like Los Agaves. The Funk Zone is a revitalized part of town that’s a great spot to get a glass of wine from a local vineyard. This small beach city is a great alternative for those that want to avoid the tourists or the college student crowds of Santa Barbara. Take a walk on Carpentaria State Beach, and later head over to The Spot, a Carpentaria institution for hamburgers and fries. If you want to stay inland, Seaside Gardens, a nursery/botanical garden hybrid boasts an extensive and unusual plant selection. This coastal city has plenty to see and do, including the Ventura Pier, and a little ways down the San Buenaventura State Beach, which boasts less crowds with beautiful views. Afterward, grab a bite to eat at Cafe Nouveau, which serves both traditional American brunch items and those with a Creole twist, like their maple bacon beignets. This stunning stretch of coast is what California coastal dreams are made of. Stop at Vintage Grocers for snacks (and people watching), before heading to Point Dume Beach. For lunch, go to Malibu Seafood for fish and chips (just be prepared for a line) and ocean views from the provided picnic tables. Though technically in Pacific Palisades, the Getty Villa is worth stopping at for the beautiful art, rich architecture, and panoramic views of the Pacific Ocean. Seeing that iconic Santa Monica Pier always feels like a small triumph every time you drive down the PCH from the north. Celebrate by dipping your feet in the warm California sand. Load up on delicious carbs at Milo and Olive, where their memorable pizza pies and garlic knots are worth the price tag. Afterward, head over to the Urth Caffe, to drink a pot of tea on the cozy back patio. Your first stop in this surf-obsessed beach town should be to catch all the action and watch the surfers from the iconic Huntington Beach Pier. Afterward, learn all about why this town has been nicknamed Surf City, USA, at the International Surfing Museum and view the world’s largest surfboard. For casual beach fare, Bunz for solid burgers and chili cheese tater tots never disappoints. Known for its picture perfect piers: Newport Beach Pier and Balboa Pier, there is no shortage of activities to fill your visit. For an adrenaline rush, head to the Wedge, where you can watch surfers ride up to 20 foot waves. Escape to Balboa Island on the ferry and walk around the town with a frozen banana in hand from Sugar ‘N Spice. Head to Mama D’s Italian Kitchen for homemade spinach ravioli and their famous pink sauce. As a major art community, this town is home to many notable galleries like the Laguna Art Lounge. The Laguna Art Museum is worth visiting to view an impressive collection of art from around the state. Soak in the coastal beauty of the town by heading to Main Beach, just steps away from the city center. Drop by Nick’s Laguna Beach for a blackened fish sandwich or the grilled steakhouse salad. 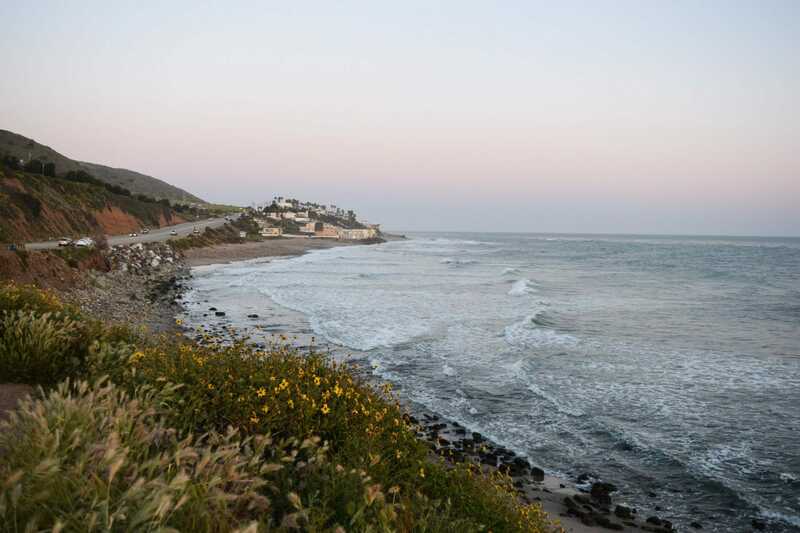 Where are your favorite Pacific Coast Highway stops?